Investing in Marijuana: High Crime? Growing support for legalized marijuana has manifested itself at the ballot box, with the recent midterm elections resulting in three more states approving some form of marijuana use. 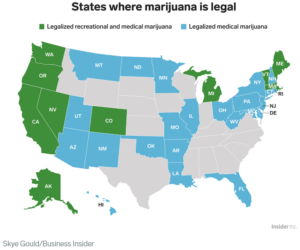 Currently, recreational marijuana is legal in ten states, with medical marijuana permitted in thirty-three states. 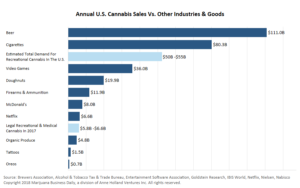 And, make no mistake about it, marijuana is already big business. Estimated legal marijuana sales in the U.S. in 2017 were between $5.8 billion and $6.6 billion. Factoring in black market demand, sales are estimated at between $50 and $55 billion – about as much as people spend on video games, McDonald’s, and Netflix combined! Note that beer sales top the above chart. Of course, less than 100 years ago, beer was banned in the U.S. when the 18th Amendment to the U.S. Constitution established the prohibition of alcohol. From 1920 – 1933, the manufacturing, transporting, and selling of alcohol was prohibited (though it wasn’t illegal to consume). There were some caveats, such as medicinal alcohol which was used to treat various ailments like the flu or toothaches and could be purchased at drugstores with a physician’s prescription (as an aside, legal alcohol sales helped Walgreens grow from around 20 locations to over 500 during the 1920s). 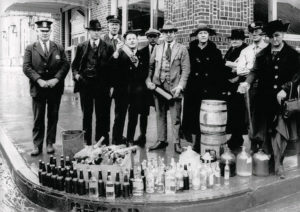 However, the bottom line is “recreational” alcohol was prohibited giving rise to bootlegging, speakeasies, and criminal activity. 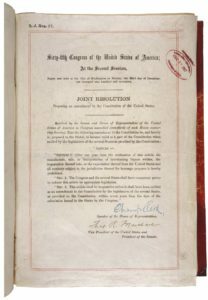 The 21st Amendment to the U.S. Constitution repealed the 18th Amendment, the first and only time a constitutional amendment was repealed by another. Looking back now, given the number of liquor stores on every corner, it’s hard to believe alcohol was ever prohibited. A growing number of Americans are viewing marijuana prohibition in a similar light. Recreational marijuana was made illegal with Marijuana Tax Act in 1937. Medicinal use was still legal, but was taxed through a cumbersome process. That was ultimately replaced by the Controlled Substances Act in 1970, which designated marijuana as a Schedule I drug and federally illegal altogether, right alongside heroin and LSD. However, at the state level, local laws can allow for recreational and medicinal use of marijuana – which brings us to today. Given increasing support for legalization, many believe marijuana will follow in the footsteps of alcohol. Marijuana was illegal in all 50 states until California passed Proposition 215 in 1996, which legalized medical marijuana. Colorado and Washington were the first to legalize recreational marijuana in 2012. Now, 33 states have some form of legalized marijuana. The trend is decidedly towards legalization. There is something called the STATES Act which, if passed, would amend the Controlled Substances Act and allow individual states to make and enforce their own laws pertaining to marijuana without federal interference. In other words, as long as individuals are following state laws, they would not be violating federal marijuana laws. President Trump has indicated a willingness to support the STATES act, a stance which has likely only strengthened as he looks ahead to the 2020 general election where younger voters are even more supportive of legalization. Along with the recent dismissal of Attorney General Jeff Session and the Democrats taking the House of Representatives, the prospects of marijuana legislation passing have increased. In the meantime, marijuana is still illegal at the federal level, which presents several issues from an investment standpoint. For individual marijuana companies, accessing traditional banking services is problematic. Banks are afraid to run afoul of federal laws. Handling cash from marijuana businesses could result in charges of money laundering. Since most banks are federally chartered, they risk losing their charter which would put them out of business. Because of that, U.S. companies involved in marijuana effectively have to operate on a cash basis and are unable to obtain loans or raise other forms of capital. Most of these companies are privately held. Some have started listing on the Canadian Securities Exchange in order to raise money. However, U.S.-based marijuana companies cannot list on US stock exchanges since, again, marijuana is illegal. 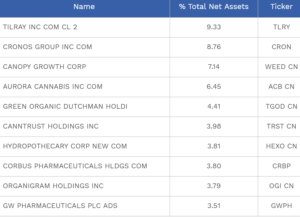 There are a handful of Canadian marijuana companies trading Over the Counter (OTC) on the “pink sheets” – in other words, not on the major exchanges like the New York Stock Exchange or Nasdaq. The reason they don’t trade on the major exchanges is because they don’t meet listing requirements. The risks of investing in any of these companies – both privately held and penny stocks trading OTC – goes without saying. As a matter of fact, the SEC recently published an investor alert titled “Marijuana Investments and Fraud” outlining risks involved here. I’m not going to belabor the potential custody issue, but would simply suggest reading this. Whether MJ or ACT, if you’re interested in playing the marijuana space, an ETF provides instant diversification. Given the number of smaller startup companies involved in this space, selecting the winners and losers could pose a significant challenge. An ETF provides a one-stop shop to play the marijuana theme. That said, while support for marijuana legalization appears moving in the right direction, obviously the regulatory backdrop presents significant risks. As long as marijuana is illegal at the federal level – or at least until the STATES Act passes – the U.S. marijuana industry will continue facing headwinds. The last time there was this much buzz over a prospective investment was bitcoin. While bitcoin may still work out longer-term, it’s not looking so good right now. The same could happen with marijuana. At the end of the day, more marijuana can always be grown. It’s fairly easily cultivated. Too much supply could be a problem. Even if legalized, successful distribution of recreational marijuana will come down to branding – like with orange juice or whiskey. Opportunity clearly exists in medicinal marijuana, but that too will face similar branding and distribution challenges as traditional pharmaceuticals. 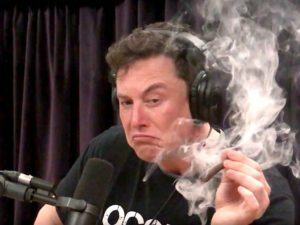 If you’d rather avoid the stress of investing in this space, another alternative would be to simply follow Telsa Founder Elon Musk’s lead and just enjoy the product – assuming you’re in a state where it’s legal, of course. Negative ETF Fees = Negative for Investors?? ?